MK4 R32 / MK1 Audi TT Stainless High Flow Cat Pipes ! GruvenParts.com is proud to release this 304 Stainless high flow cat pipe for the VW MKIV R32 and MK1 Audi TT with the 3.2L VR6 motor. This high flow cat pipe comes ready to install and bolts directly to the OEM down pipe. This pipe increases torque and horsepower in the mid and high range of the powerband by eliminating the restrictive factory cat pipe. This part is intended to replace OEM P/N 1J1-131-701-JX (1J1131701JX). This pipe is precision mandrel bent from T304L stainless steel so it has no crimps and will not rust. The twin pipes are 2"" diameter and are merged with a 2.5"" single outflow pipe with smooth transitions for free flowing exhaust pulses. This pipe comes as shown with 2 brand new Magnaflow cats , 2 OEM gaskets, and all installation hardware. And, its made right here in the USA ! This part is intended to replace OEM P/N 1J1-131-701-JX (1J1131701JX). Audi/VW 4.2V8 Intake Linkage Arms ! Audi/VW 4.2 V8 Intake Manifold Pivot Levers ! 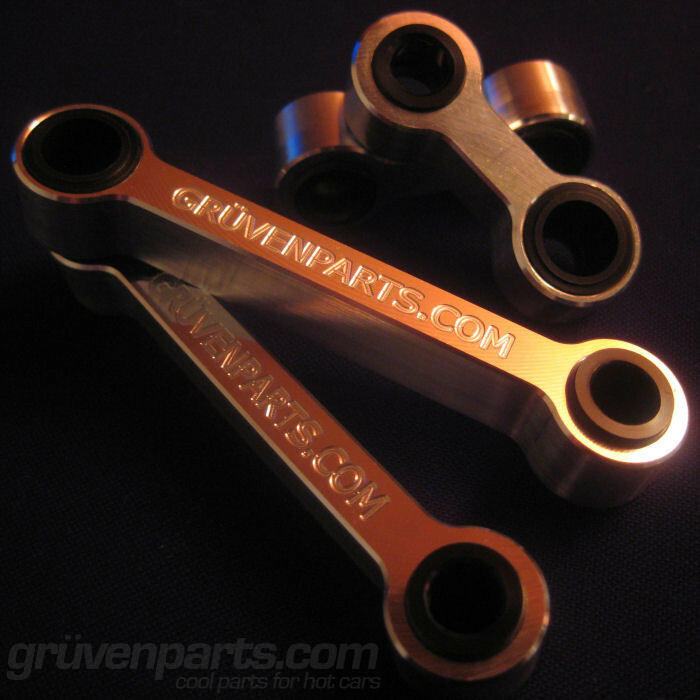 GruvenParts.com 4.2L V8 Intake Manifold Linkage Arms and Pivot Levers : Warranted for Life ! Got a 4.2L V8 Audi or VW ? Then you had better check your intake manifold actuator arms Audi/VW P/N 077-198-327A (077198327A) and the corresponding Manifold Pivot Levers ! The OEM plastic versions quickly break, leaving your intake manifold rod stuck which causes poor idle, drivability, loss of power, and poor fuel mileage. This is a very common problem on the Audi/VW 4.2L V8, an otherwise great engine. The dealer will only sell you a repair kit for the linkage arms at nearly $400, and each repair kit only comes with 1 of each length linkage arm. If your vehicle has 2 broken linkage arms, you would need to buy 2 dealer repair kits (cost nearly $800)! If you need a pivot lever, you are really out of luck, as the dealer will only sell you an entire intake manifold at a cost of several thousand dollars ! Our Billet intake manifold arms and pivot levers are made from aerospace grade 6061-T651 aluminum with the linkages containing specially machined black Delrin inserts to provide a perfect fit to the actuator *****. These parts are warranted for life! Dont go to the VW/Audi dealer and pay big bucks for the new actuator kit or entire new manifold when all you need are these parts (the actuators themselves rarely fail). And DONT pay that kind of money for another set of plastic arms and levers that will break again in quick order. Go with GruvenParts.com and NEVER WORRY ABOUT THIS AGAIN ! Billet Aluminum VW/Audi 4.2L V8 Oil Cooler Tubes ! 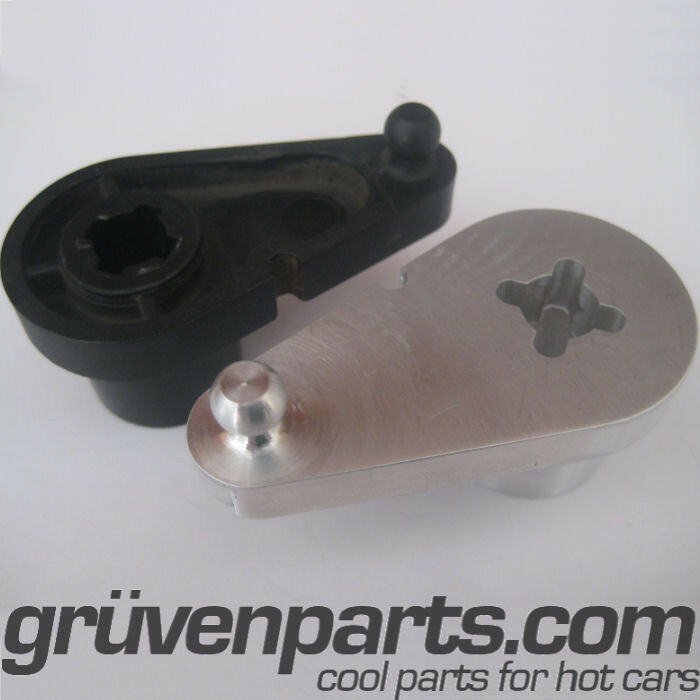 GruvenParts.com is happy to announce this LIFETIME WARRANTED latest billet release for the Audi/VW 4.2L V8 engines with oil cooler pipe P/N 077-117-411A (077117411A). Our version is machined here in house on one of our state of the art HAAS milling centers and carries a LIFETIME WARRANTY ! This part is milled from Aircraft Grade 6061-T651 Billet Aluminum and includes 4 preinstalled Viton O-Rings for maximum durability. The plastic OEM tube often breaks due to heat degradation causing coolant leaks that could lead to the ultimate failure of the engine. Because this part requires a great deal of labor to get at, you should always install this Lifetime Warranted Billet Aluminum version when doing this job. Click the product page to also view a complete DIY on the replacement procedure. VW Phaeton w/4.2L Engine - ALL"